In discrete mathematics, the floor function (also called the greatest integer function or integer function) maps a real number onto the next lowest integer. 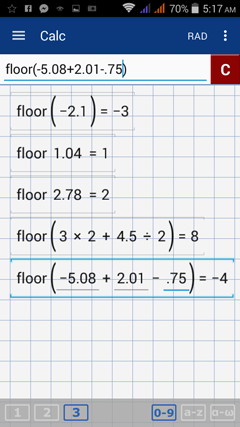 In general, floor(x) is the largest integer not greater than x. To find the floor of a real number x, type the word “floor” using the letter keys, then go back to the number keyboard to type the argument. If the argument is longer than one term, enclose it in parentheses. For each number below, find the floor value. Type "floor" before each argument.